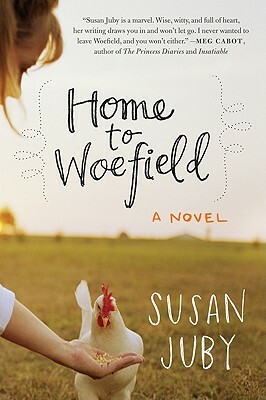 Susan Juby, already a reader-favorite YA author, makes her triumphant first foray into adult contemporary fiction with Home to Woefield, a hilarious, wildly original, and wonderfully insightful tale of no-so-ordinary life down on the farm. Told in four delightfully distinct narrative voices—a crusty 70-something farmer, a hair band-loving teen, a precocious 11-year old, and an earnest New Yorker in her 20s—Home to Woefield will enchant readers of all ages, as its motley cast struggles to avoid foreclosure with outlandish schemes and prize-winning chickens. SUSAN JUBY is the author of the critically acclaimed Getting the Girl and Another Kind of Cowboy, as well as the bestselling Alice series (Alice, I Think; Miss Smithers; Alice MacLeod, Realist at Last) and her latest novel for adults, The Woefield Poultry Collective. After dropping out of fashion college and attaining a BA from the University of British Columbia, Susan went to work in the book industry. She holds a master’s degree in publishing. She currently lives on Vancouver Island with her husband, James, and their dog, who prefers to remain anonymous. Visit her online at susanjuby.com. What is the significance of family in Woefield? How does the definition of family evolve throughout the novel? Earl and Sara have opposite experiences with biological family over the course of the book: Sara is distanced from her family, and Earl is reunited with his brother. What are the positives and negatives of both these situations? Before leaving Sara at Woefield, Mrs. Spratt attempts to hide the actions of her abusive husband. She tells Prudence that it is the neighbours who want the chickens gone, she sits in her car at night, and she has planted the largest bush in the neighbourhood in front of her picture window. Do you think that Mrs. Spratt taking off and leaving Sara at Woefield took strength, or is it another form of hiding? What else could she have done to make things easier for Sara? Will Sara and her mother be able to resume a meaningful relationship? How will Sara’s father factor in? The chapter with the Mighty Pens writing group is a satire of the creative writing group experience. Are there other examples of satire in the novel and what role does satire play? After her trip to the bank, Prudence thinks that “Our energy affects the things we create.” Do you think that this true in Woefield for some or all of the characters? If so, how does the energy of the characters affect the outcome of their actions? The course of the book could be seen as “recovery” for each of the characters: Sara from her family problems, Seth from alcoholism, Earl from his past with his brothers. Prudence has several comparatively minor problems with her boyfriend and her writing career at the beginning of the book. Is Prudence in recovery? Why or why not? At the beginning of the book the characters are each in the habit of making assumptions about each other. For example, Earl assumes that Seth must be on drugs, and Prudence has many assumptions about rural life. How do the attitudes and assumptions of the characters evolve throughout the book, or not? Can any of the assumptions made by the characters be seen as positive? Prudence grew up going to boarding school, and though she corresponded with her uncle who owned Woefield, he didn’t seem to be interested in actual farming. Where do you think Prudence’s enthusiasm for farming and environmentalism originated? What could have fostered such an intense interest in rural life in a young woman from New York? The contrast between the values and opinions of Prudence and Eustace is quite significant. Do you think that their relationship stands a chance? Why do you think Sara relates to Left Behind even though she lacks a religious background? Does her interest in the book help or hinder her ability to cope with the problems in her life? Seth’s personality changes when he drinks. If his drinking works as a coping method to help him deal with other people, why do you think that he still stayed home for all of those years? At the end of the novel, Prudence and her friends have successfully put on their bluegrass concert, however, we’re not certain what the future of the farm will be. With their best efforts, do you think that Prudence and friends will be able to keep Woefield afloat? Why or why not? Prudence still hasn’t realized her dream of working behind a table groaning with organic produce at the farmer’s market. Do you think that she can realize this dream?